Drop-down lists, list boxes, selection lists. You can either type text in the edit box or select an item from the list. The lists can be edited in Options/Dropdown Lists function. List boxes speed up data entry procedures. Instead of entering the whole text you can select the item. Locked: administrator should define list values in the Dropdown Lists window. Locked data entry allows to select the value from the predefined list. New values can't be added by data entry personnel. 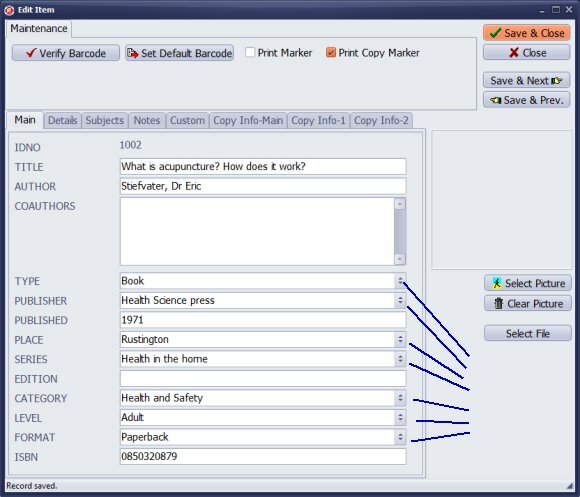 Editable: predefined values and new values could be entered by the data entry personnel. New items are not added to the predefined list. Auto-Add (default setting): There is predefined dropdown list. Data entry personnel are allowed to choose items from the list or enter new ones. New items are automatically saved for the future use. Library, Item Edit window displays several dropdown lists: TYPE, PUBLISHER, PLACE, SERIES, CATEGORY, LEVEL, FORMAT. 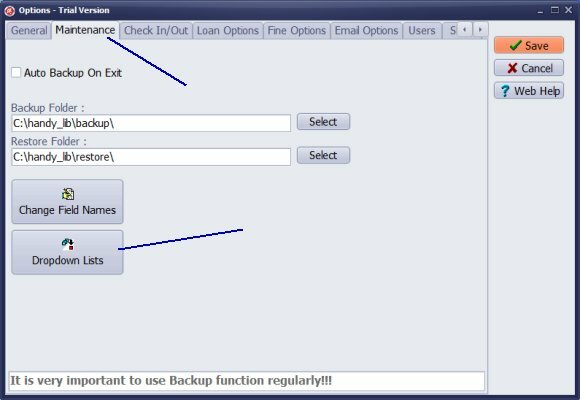 Click Options/Maintenance to access Dropdown Lists function. There are several data fields that have already a dropdown list data entry control. Check mark in the front of the text field defines dropdown lists. On you computer create a new folder. In this folder store your "dropdown list" text file. 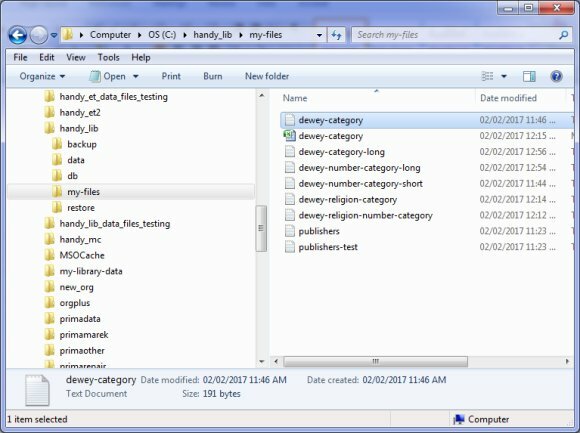 Use Windows Notepad to create/edit those files. Enter list values, one per line. 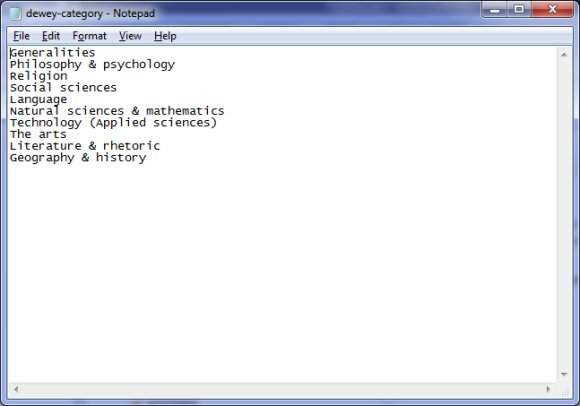 For example this text file represents short list of Dewey subject categories. How to load list items from the text file? Select data field: for example CATEGORY (1) (dropdown list data field). Click Load From File (3). Select your list text file. New items are displayed in the Dropdown List Items (4) box. Note: you can also type in any item directly in the box (one per line). Click Save Items to save new entries. When adding borrowers and I go to the dropdown to select a TYPE of borrower is there a place to edit the dropdown categories to fit my needs better? Like where I could categories them into grades (first, second ...) instead of Adult, Child, Junior, Senior? To access dropdown lists function open the Options window, click the Maintenance tab, and click the Dropdown Lists button. How to edit dropdown lists? 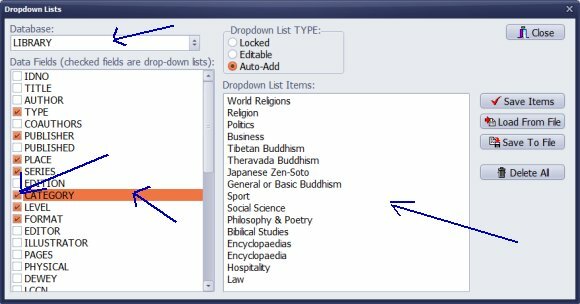 How to preload dropdown lists for the library data entry personnel? 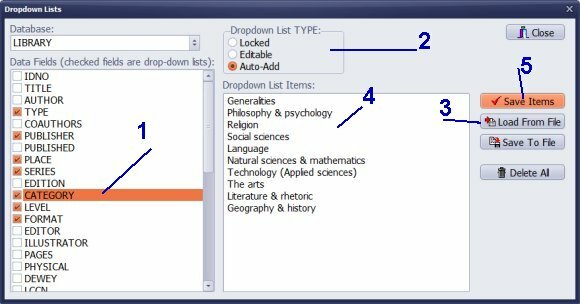 Learn about different types of dropdown lists: auto-add, locked (fixed), editable?